Meprotixol is a cough suppressant. It has also been used for the treatment of rheumatic diseases. ↑ Hougs, W.; Nielsen, I. M.; Norn, S.; Nymark, M. (1966). "Pharmacology of a new antitussive agent: Meprotixol (N 7020)". Acta pharmacologica et toxicologica. 24 (1): 3–23. doi:10.1111/j.1600-0773.1966.tb00364.x. PMID 6012748. ↑ Kogstad, O. (1974). 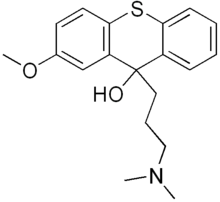 "Meprotixol (N 7020). Clinical experiences in rheumatic diseases". Tidsskrift for den Norske laegeforening : tidsskrift for praktisk medicin, ny raekke. 94 (4): 212–214. PMID 4595469.